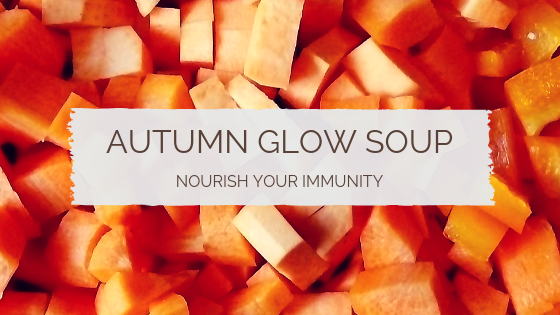 Perfect for fending off colds as the weather turns damp and cold. Makes enough for 4-5 servings. Melt the ghee or coconut oil in a large pan. Once warmed, add the onion and cook gently for 5 minutes. Add the spices and ginger and stir well. Add all the vegetables and passatta, stir well, and cook for 2 minutes. Add the stock, bring to the boil, then simmer until vegetables are soft. Allow to cool, then blend till smooth. Serve with an extra dash of black pepper and drizzle of soya or cashew cream. 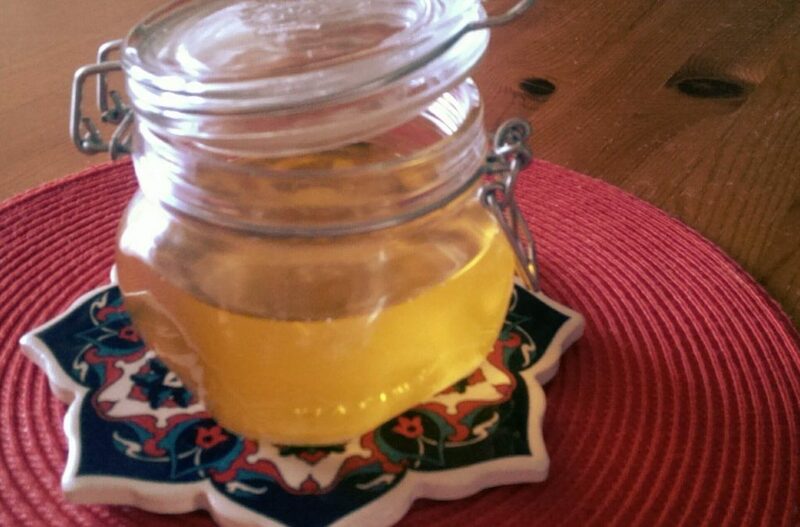 Homemade ghee is low-cost, delicious, and super easy to make. 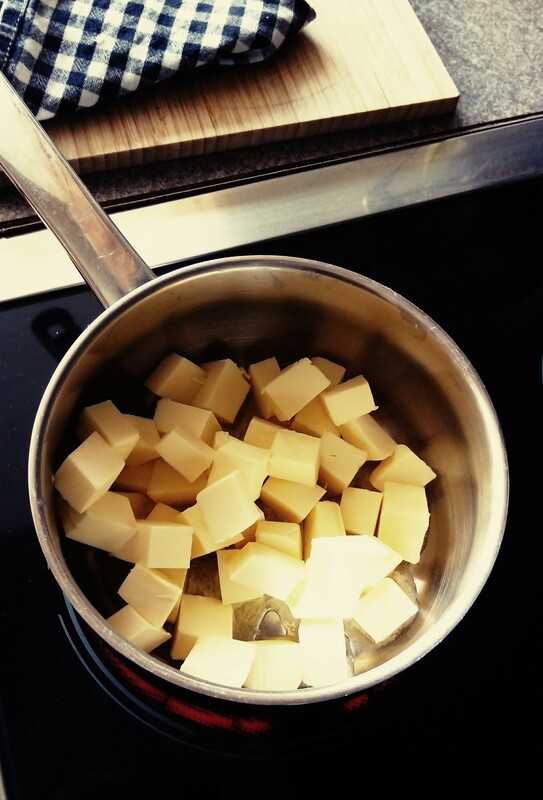 As a cooking fat it is stable at higher temperatures, and adds a unique flavour to curries and risottos, and pretty much any other dish requiring butter or oil! Ghee is simply clarified butter: pure butter fat with virtually no protein residues left. This makes it tolerable for some people with mild dairy protein sensitivities – though I wouldn’t recommend ghee if you have a dairy allergy as it isn’t guaranteed to be 100% whey and casein-free. 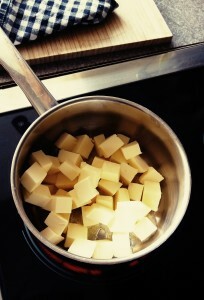 Dice the butter into small cubes and heat gently in the pan. The melted butter will start to bubble and foam. After a few minutes the bubbles will go down, and then start up again. After this second round of bubbling and foaming, you will see a dark reddish coloured residue at the bottom of the pan. The ghee is now done! 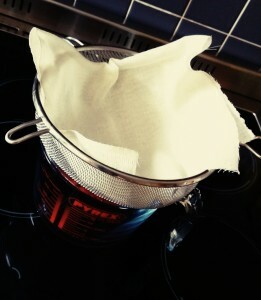 Remove from the heat and allow to cool for a couple of minutes, then strain through the sieve into the jug. 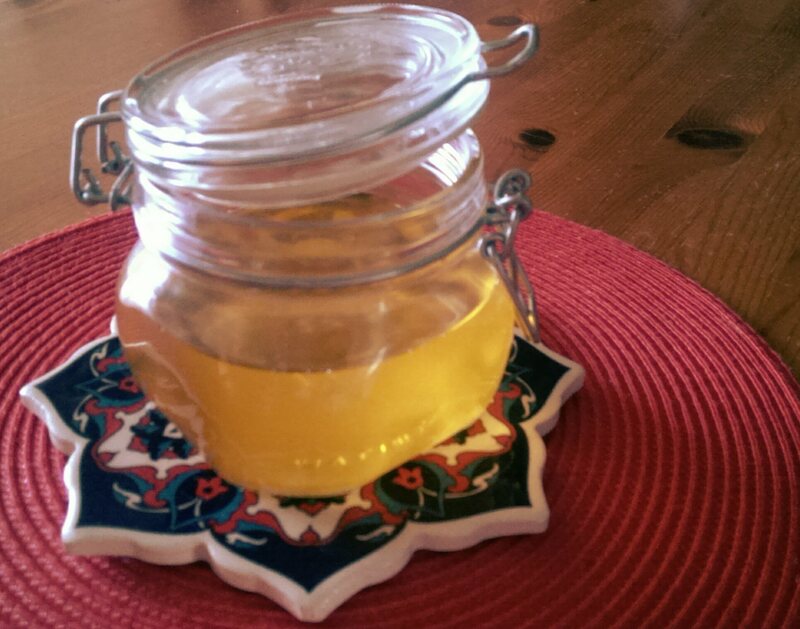 Carefully pour the ghee into your storage jar, and allow to cool to room temperature. By now, the ghee will be starting to set. Fasten the lid securely and allow it to set completely. Your ghee is complete -enjoy! Midweek lunch has to be the most neglected meal. Squashed in between meetings, deadlines, errands, phonecalls, school runs, it’s too often relegated to Boring Sandwich, ‘Meal Deal’ or Nothing. Unless you’re in France, in which case take two hours off and dine like you mean it. First things first: preparation. As with all good meals, the magic is in the prep. Create a list of foods to purchase every week so you always have the necessary bits to hand to make lunches. If you don’t buy it, you can’t eat it! Think about vegetables, salad leaves, fruit, tinned fish, fresh meat (see below), and grains like rice, quinoa and buckwheat for salads. 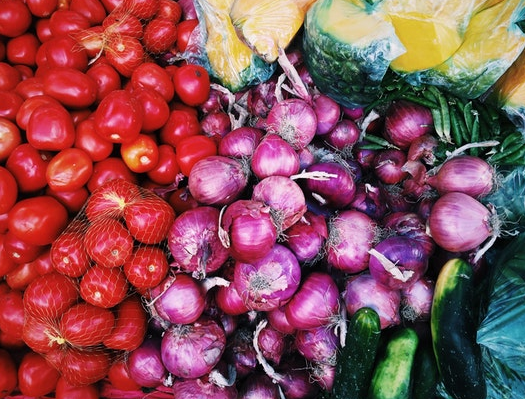 Once you’ve stocked up, take a few minutes to think about the week ahead: how many lunches do you need to prepare? Where will you be eating? Does it need to be cold food, or are reheatable items an option? Use the free 7-Day Meal Planner to capture ideas! – Slow cooked meat: at the weekend I like to slow cook a chicken. I use a slow-cooker so it’s merrily cooking away while I get out and about. We eat some for Sunday dinner, and the rest is left for pack-ups. Slow-cooked ham works well too, just shred it with forks and you have pulled-pork filling for pittas or salad. – Houmous: there’s a classic houmous recipe from my friend Gina, or try these varieties from Deliciously Ella. – Roasted vegetables: chop peppers, aubergine, courgettes, and fennel into chunks and roast in coconut oil for 30-40mins. – Pesto: this works well with cashews instead of pine nuts. – Brown rice or quinoa: remember to cool rice quickly and store in the fridge until eating. All prepped? 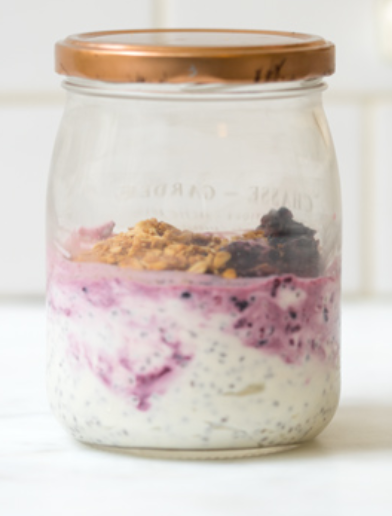 Now to spend 10mins each morning creating that knockout lunch*…. Salad Box: rice or quinoa topped with a protein (shredded ham / hardboiled egg / houmous / fish) and a mixture of roasted vegetables and handful of salad leaves. Dress with a drizzle of olive or flax oil, squeeze of lemon, and black pepper. Sandwiches: not the boring ones. Swap dull bread for good quality sourdough or for gluten-free options think creatively and use nori wraps, corn tortillas, or large butterhead lettuce leaves to hold the fillings. Soups: my all time favourite lunch. Enjoy with oatcakes and houmous or small chunk of good quality cheese. Pasta Box: leftover pasta (regular or gluten-free) with pesto, roasted vegetables and cherry tomatoes. 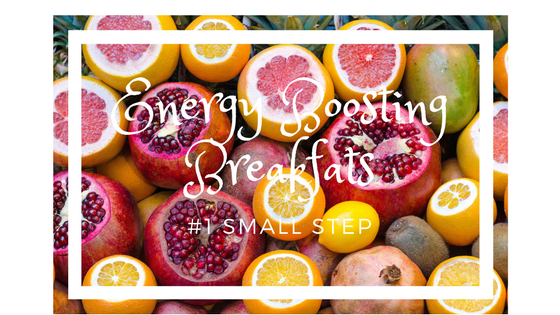 This can be tricky when you have specific dietary needs like gluten or dairy free, but it is getting easier. I was deliriously happy to discover a ‘Leon’ outlet at the motorway services recently and enjoyed a delicious wheat and dairy-free chicken and brown rice meal! 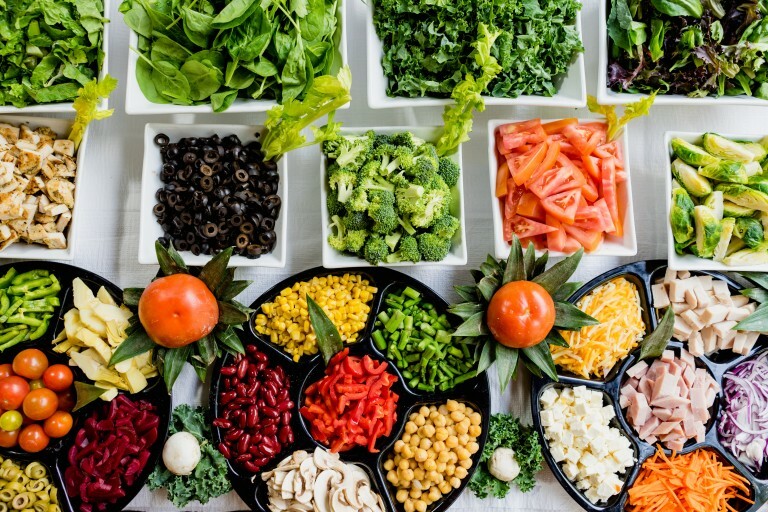 If you know your options are limited when eating out, carry some basics with you like trail mix and a piece of fruit so you can top up if there’s not much available. Most city centres have a Pret and an M&S: Pret have a good selection of soups, salad boxes, chopped fruit, and snacky things like nuts and hardboiled eggs with spinach. Marks & Spencer offer mixed grain salads, picnic sized cheeses, chopped fruit, nuts, and houmous pots. Stuck at a tiny cafe in the middle of nowhere? How about a baked potato, omelette, or soup. 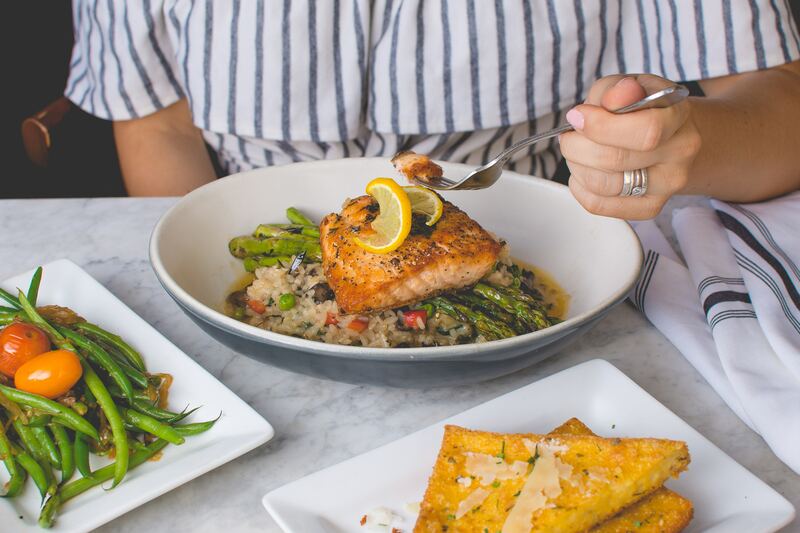 Whatever your day holds, a nourishing lunch is essential to sustain your energy and wellbeing. 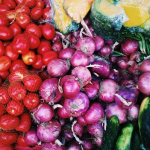 Symptoms of fatigue, irritability, anxiety, poor concentration and depression are all influenced by the foods we eat, so give your body it’s best shot at working well by feeding it with love and care. Try these ideas and see what a difference they make to your life – do let me know via email or over in the Facebook group! Another small step you can take towards improving energy levels and overall health, is to start the day with a nourishing breakfast. Eating within 2 hours of waking means your body doesn’t have to produce extra stress hormones to support your blood sugar levels. 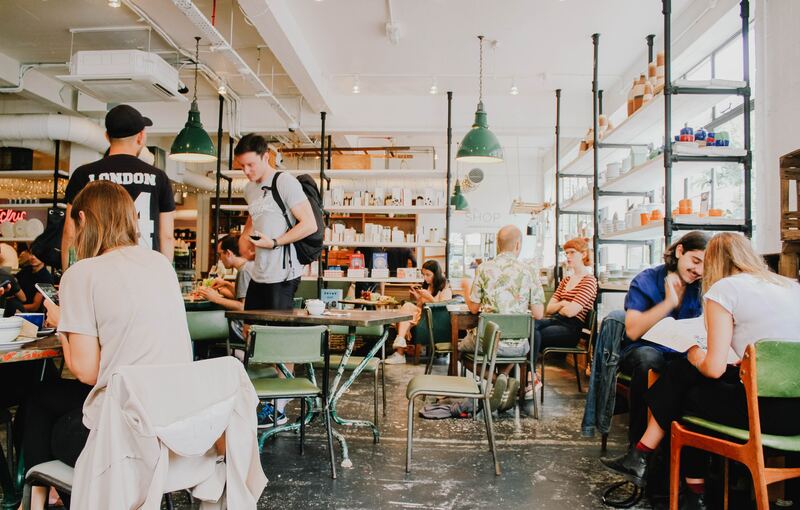 When this happens, your energy stores are playing ‘catch up’ for the rest of the day and you are likely to find yourself reaching for sugar and caffeine fixes to keep going. This recipe-roundup is packed with creative ideas for your first feed of the day. 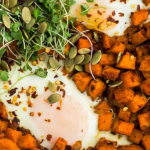 Save time by using leftover cooked sweet potatoes from the day before in this protein and antioxidant packed breakfast. 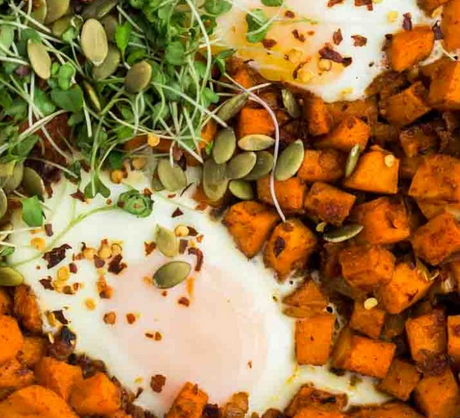 You can swap sprouted seeds for watercress or rocket – and in case you’re wondering, pepitas are pumpkin seeds! Fluffy Breakfast Quinoa from Food Heaven Made Easy: P GF DF Ve Again, this one involves a bit of pre-prep to save time in the morning. Cook a large serving of quinoa at the start of the week and dip into it for breakfasts and lunchtime salads. 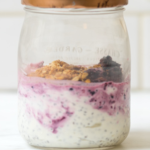 Grab & Go Chia Yoghurt Parfait from 101 Cookbooks: P GF swap to a plant based yoghurt for DF Ve This one really is for the super-quick breakfast people! 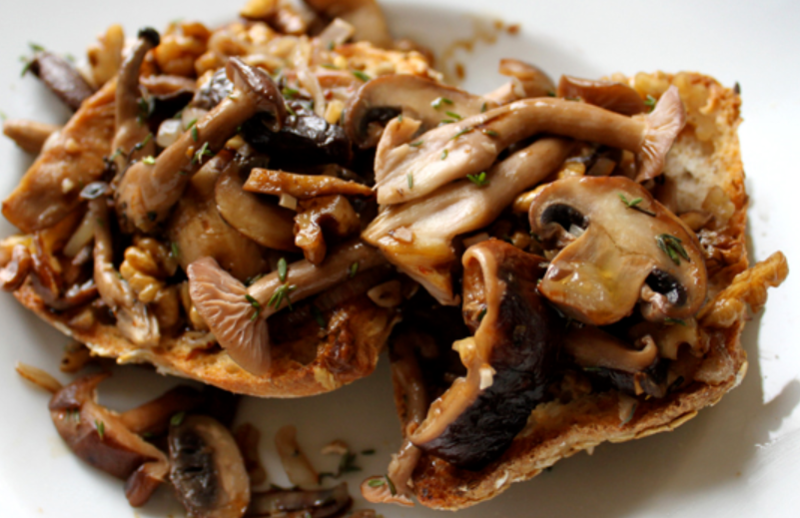 Wild Mushrooms on sourdough toast: from My New Roots: use olive oil to make it Ve & DF, and non-gluten bread for GF Regular mushrooms can be used in place of wild ones, and as Sarah says in the post, keeping a packet of dried mushrooms in the store cupboard means you can add them to any mushroom dish for deeper flavours and higher nutrient value. 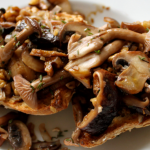 Mushrooms are a fantastic source of fibre, immune-supporting nutrients, and vitamin D.
A warm breakfast packed with protein, fibre and antioxidant plant nutrients from the herbs & spices! 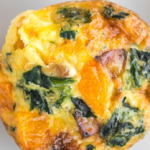 Butternut, Spinach & Sausage Egg Cups: from Real Food Whole Life P GF DF Make these in advance and you have a ready-to-go breakfast option for days and days. They freeze well too. If you prefer a meaty version there’s an option for including good quality sausage or bacon. 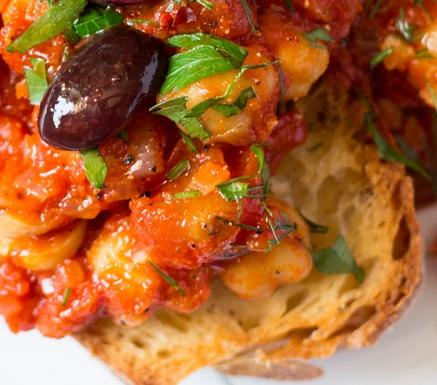 This recipe comes from Elena Holmes, a fellow nutrition consultant and superb vegan cook! 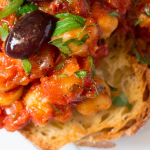 Based on a traditional dish from northern Italy, Elena has added more vegetables and spices to increase the taste, colour and nutritional quality. Carefully mix the flour, water and salt until it has the consistency of cream or gravy – use a whisk to avoid lumps. 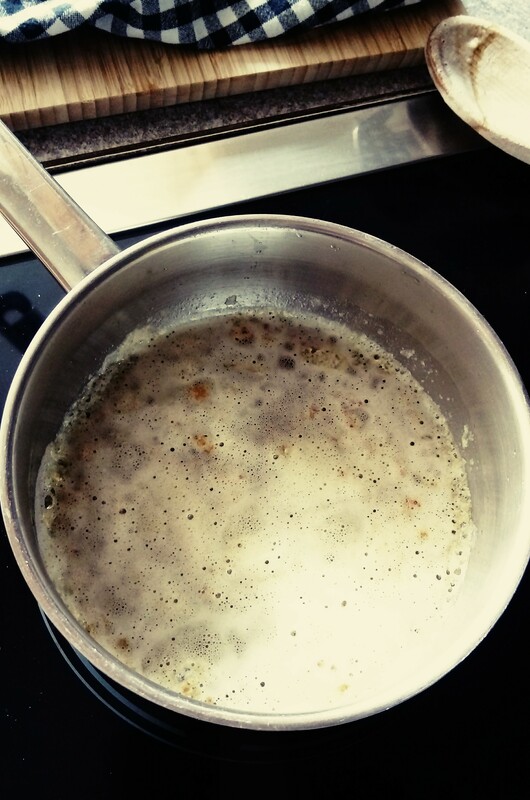 Leave this mixture to rest for 40-60mins. Dice the vegetables and sage. Oil a standard sized baking tray and scatter the veg and sage evenly over it. Add your chosen spices. Pour the flour mixture over the vegetables, drizzle sparingly with olive oil and bake for 25-30mins until the vegetables are cooked andthe farinata has the consistency of soft flat bread. Allow to cool for a few minutes then cut into pieces and serve. Leftovers can be eaten cold the next day.